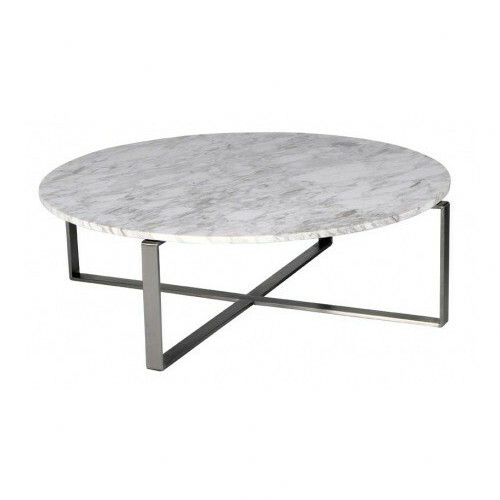 This contemporary coffee table comes with a round Athenian marble table top and stylish stainless steel legs. Easy to clean, this coffee table is of great classic beauty and timeless elegance. It will complement a large number of outdoor settings. Back in 1999 an architect and a visual merchandiser combined their specialist talents & 25 years experience to create R+V Living in Sydney Australia. Cornerstone of R+V Livings success is in the design and creation of ranges of outdoor/indoor furniture with a unique fashion look: not only perfect for today's lifestyle, but for years to come. All at the best possible value for money. The R+V Living team travels overseas regularly to immerse themselves in latest international design trends. They also visit their own factories closely monitoring quality control. A commitment to better design and better quality, with professional, personable service. The Mercy Round Marble Coffee Table is a Contemporary or Luxe style product. Contemporary style bridges the gap between traditional and modern. Pieces feature simple and clean lines with smooth surfaces without any carving or adornment. You can shop for more Contemporary or Luxe Coffee Tables in the Furniture section of our site. When you buy a Mercy Round Marble Coffee Table online from Temple & Webster in Australia, we make it as easy as possible for you to find out when your product will be delivered to your home in Melbourne, Sydney or any major city. You can check on a delivery estimate for the R&V Living Part #: LR-CFBI000DIAM(AM) here. If you have any questions about your purchase or any other Outdoor Tables product for sale our customer service representatives are available to help.Whether you just want to buy a Mercy Round Marble Coffee Table or shop for your entire home, Temple & Webster has a zillion things home. Everyone comments on how fabulous this table looks in my lounge room. Heavy and functional, love it! Happy with the coffee table although feel the marble top could have been slightly thicker.